(Phys.org)—A trio of researchers with Anglia Ruskin University in the U.K. and the Australian National University has found that the male fiddler crab uses its oversized claw to get the attention of a prospective mate and then uses drumming to demonstrate its degree of physical fitness. In their paper published in the journal Royal Society Open Science, Sophie Mowles, Michael Jennions and Patricia Backwell describe their study of the crab and what they found. Many beachgoers have encountered fiddler crabs and have likely noticed that the males have one oversized claw. This, the researchers contend, is to help the male attract the attention of a prospective mate, by waving it at her. 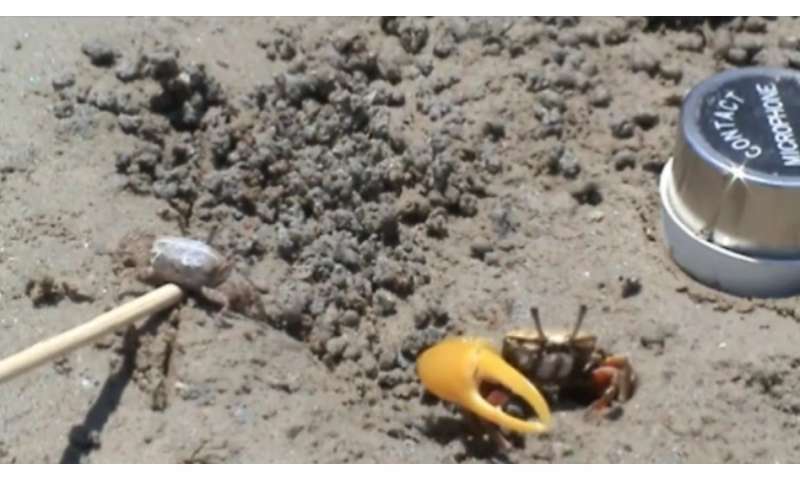 To learn more about the mating behavior of fiddler crabs, the researchers studied them in their natural environment at East Point Reserve in Darwin, Australia over the period from September to November 2014. To make it easier to witness the mating action, they captured some females just prior to mating and attached them to wooden dowels, which allowed for placing them for easy observation. They also planted microphones in the sand near burrows that had been created by males—both for their own use and for a prospective mate. After studying the mating rituals of the males, each was captured and placed on an artificial track where they were urged to run with a wooden stick. This allowed the researchers to test their endurance. In watching the males and females interact, the researchers found that the females tended to prefer to mate with those males that had a larger claw and who also drummed the fastest. They believe the drumming is an indicator of physical strength and stamina (which was supported by track running tests), which suggests their fitness for caring for the female and offspring. The team also found that those males that drummed the most rapidly tended to have the largest burrows, which the females preferred, because after mating, they moved into their mates' burrow to incubate their eggs. The researchers also found that drumming was an effective means for allowing the males to demonstrate their fitness, even while inside of their burrow—an arrangement that allowed the female to judge the male without the risk of being coerced into mating when taking a peek inside a burrow to see how large it was. Courting males often perform different behavioural displays that demonstrate aspects of their quality. Male fiddler crabs, Uca sp., are well known for their repetitive claw-waving display during courtship. However, in some species, males produce an additional signal by rapidly stridulating their claw, creating a 'drumming' vibrational signal through the substrate as a female approaches, and even continue to drum once inside their burrow. 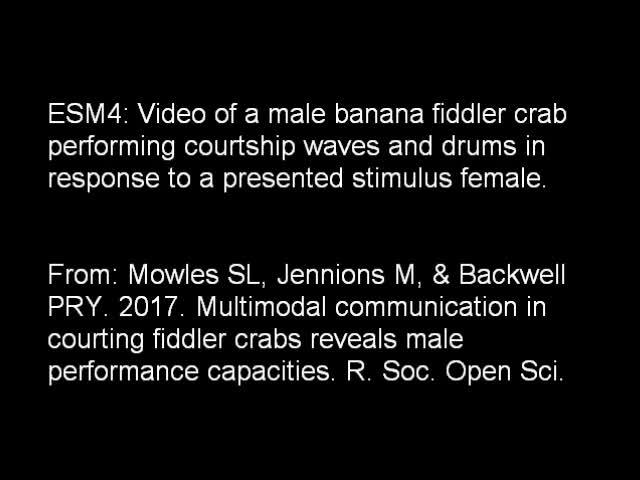 Here, we show that the switch from waving to drumming might provide additional information to the female about the quality of a male, and the properties of his burrow (multiple message hypothesis). Across males there was, however, a strong positive relationship between aspects of their waving and drumming displays, suggesting that drumming adheres to some predictions of the redundant signal hypothesis for multimodal signalling. In field experiments, we show that recent courtship is associated with a significant reduction in male sprint speed, which is commensurate with an oxygen debt. Even so, males that wave and drum more vigorously than their counterparts have a higher sprint speed. Drumming appears to be an energetically costly multimodal display of quality that females should attend to when making their mate choice decisions.